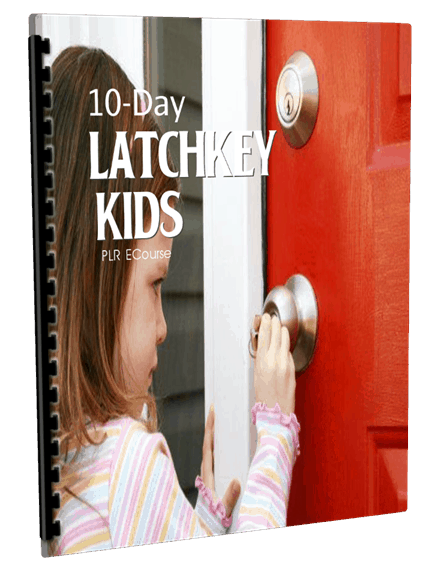 10-Day Latchkey Kids PLR ECourse ready to be used for list building, autoresponder emails and training your subscribers. 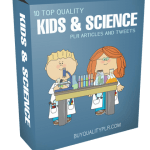 As you just already know, The Latchkey Kids is evergreen and extremely profitable, so building your Latchkey Kids email list, and training your customers while monetizing your emails is the best way to make money with this Latchkey Kids PLR newsletter emails. 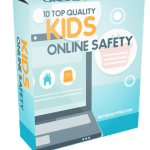 This is a complete ecourse consisting of Latchkey Tricks emails messages with private label rights to help train your customers on Latchkey Kids . There are both good and bad things about being a latchkey kid. Before you decide to let your child be one, it’s important to learn about the pros and cons of the decision. It’s not to scare you away, because like many families today, the choice of whether to have a latchkey kid or not may not really be a choice, but rather a necessity. Either way, choice or not, both good and bad things can come from it. First, let’s go over the potential downfalls of being a latchkey kid, focusing on the effects on the younger child. Many latchkey kids are often lonely and fearful. They come home all alone and sometimes stay into the night alone, unable to call anyone, watch TV, or participate in any activities with other kids their age due to not having a ride or any adult support. The way to mitigate this issue is to make sure that you don’t make arbitrary rules about doing things with friends who do have adults around, or talking on the phone, or even being online. Make sure the rules you make have a reason for existing. Also, make sure that you check up on your child often during the time they’re going to be alone, talk to them about their fears, and check in with them about whether they feel lonely or not, and need more adult company or activities to keep them busy. When children are lonely they are often more open to their friends or even kids pressuring them or encouraging them to use drugs and alcohol or participate in sexual activity to alleviate boredom. This can be a big downside to being latchkey because these poor choices can affect a child for a lifetime. The best way to avoid this problem is to check up on your child so that you know they’re ready to make good decisions, whether you’re home or not. Plus, if you talk to your child a lot about issues, they will know that you’re available to them at any time to talk to about what’s bothering them. If you do have a child who likes to do things behind your back and only responds to more supervision and strict rules, being latchkey may not be appropriate for them. One big issue about being latchkey today is that some kids feel that it’s necessary to hide their status from others. Parents are afraid that neighbors will report them to the authorities. Rules have become stricter regarding the ages and lengths of time you can leave a child home alone. Make sure you check the laws in your area so that you’re in compliance to avoid this problem. Now let’s talk about the good things that can come from being a latchkey kid of caring and loving parents. A great outcome for latchkey kids is that when successful, the children end up with added self-esteem which makes them more likely to resist peer pressure, drugs, alcohol and early sexual activity. They feel good about making adult choices in a responsible way, and this helps them build their self-image with each good choice made. The way to ensure this happens is to give them rules with reasons that aren’t arbitrary. When you explain to a smart child why they should or should not do something, it can help them make good choices. Good choices need to come from within and not from fear of punishment. If you’re open with your child, listen to them, and build your relationship with them based on honesty, it will help build their self-image even more. One issue with many children is that they’re so booked up with activities that they cannot imagine anything because they are so busy. They don’t get a chance to use their imagination. Someone got the idea that keeping kids overly booked will cut down on drug use. But, it also cuts down on them getting to imagine things so that they have time to discover what they truly enjoy doing. Imagine if Mark Zuckerberg’s activities were controlled by his parents’ desires instead of his interests? He may not have spent time in a dark room learning Atari BASIC programming. What if Christopher Nolan didn’t have time to play with his Super 8 as a child? It’s great to let kids be bored so that they can find something they truly love and enjoy doing with their life beyond childhood. 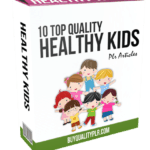 Why Purchase This 10-Day Latchkey Kids PLR eCourse From BuyQualityPLR.com? 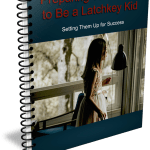 We will only be selling 50 copies of this Latchkey Kids , so don’t waste any time and grab your PLR license while it’s still available for sale.